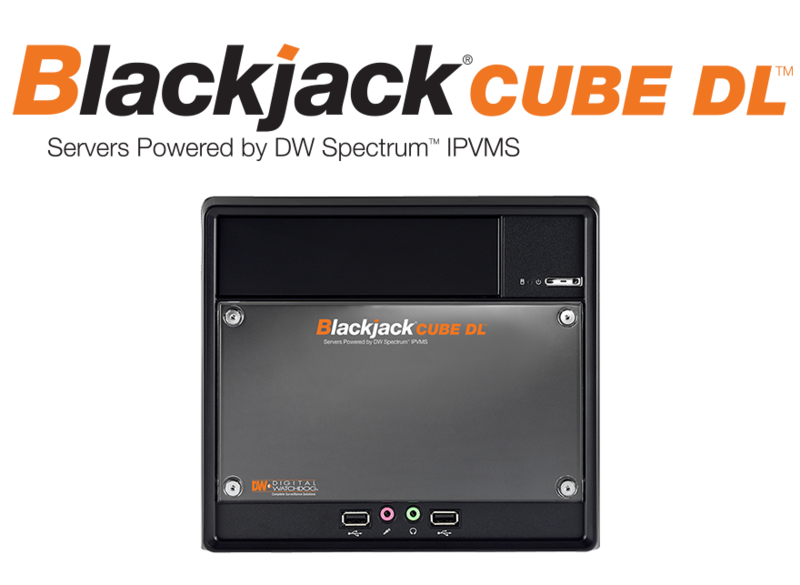 Cerritos, CA (September 11, 2017) – DW® (DW®), the industry leader in digital recorders, surveillance cameras and related management software, announces the release of our new Blackjack® CUBE DL™ NVR powered by DW Spectrum® IPVMS. The new Windows-based server offers users a high-end solution to record and manage up to a maximum of 480Mbps throughput or three (3) Panzilla® cameras (MEGApix® PANO™ 48 Megapixel Multi-Sensor Camera — DWC-PZV2M72T). The Blackjack® CUBE DL™ can record and manage single-sensor IP cameras of any resolution, with an equivalent capacity of up to 96 2.1MP cameras at 30fps and a maximum of 480Mbps throughput or upto 3 Panzilla® cameras with either 48MP or 32MP (MEGApix® PANO™ DWC-PZV2M72T). The hardware includes an Intel® i7® processor, 16GB of memory, a high performance professional graphics card, enterprise class hard drives, Windows® operating system residing on a solid state drive and is pre-loaded with DW Spectrum® IPVMS including a license for 4 channels of multi-megapixel recording. The NVR is ONVIF conformant and is available with 4-20TB HDD. Blackjack Cube DL NVR models come with our unbeatable 5 Year Limited Warranty and DW Spectrum® 4-channel license included (DW-SPECTRUMLSC004) . One (1) DW-SPECTRUMLSC004 4-channel licenses included. Learn more about the Blackjack® Cube DL™, the complete Blackjack® NVR family and all of DW®’s industry-leading video surveillance products at www.digital-watchdog.com. Click here to download the New Product Announcement. DW® empowers our customers as the industry-leading single source of value-driven complete solutions for all video surveillance applications (HD Coax™ / hybrid / IP enterprise), focusing on ease of use and ROI. DW® products offer technologically-advanced features including multi-sensor HD cameras at real-time 30fps, Star-Light™ super low light technology, WDR, Smart DNR™ and Smart IR™. Complete IP megapixel surveillance solutions include single- and multi-sensor MEGApix® cameras and edge recording systems, Blackjack® NVRs and DW Spectrum® IPVMS for server, mobile and on-camera control. Complete HD Coax™ surveillance solutions include single- and multi-sensor STAR-LIGHT™ HD Coax™ cameras, VMAX® Universal HD over Coax™ DVRs and mobile management applications.